We'd love to send you offers, discounts and the latest info from Niwaki. Your details will be kept safe and secure, and will not be shared with anyone else. You can withdraw your consent at any time. *Ends midnight Sun 28 April GMT. Surcharges may apply. Not in conjunction with any other offer. 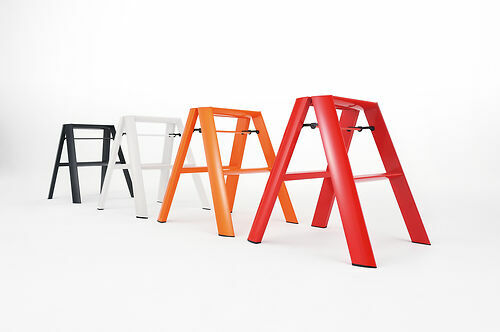 New from Japan, the Lucano Step Stool is already winner of the RED DOT DESIGN awards for its simple, practical design. Folding down to 6" deep it is small enough to easily tuck away, but in black, white, red or funky orange it is stylish enough to leave out as a practical and ornamental stool. We use them as chairs at Niwaki HQ. Incredibly light, and perfect for reaching high cupboards and shelves. Not much good in the garden though. You haven’t viewed any products other than this one, keep browsing and you will see a list of the products you have viewed here.